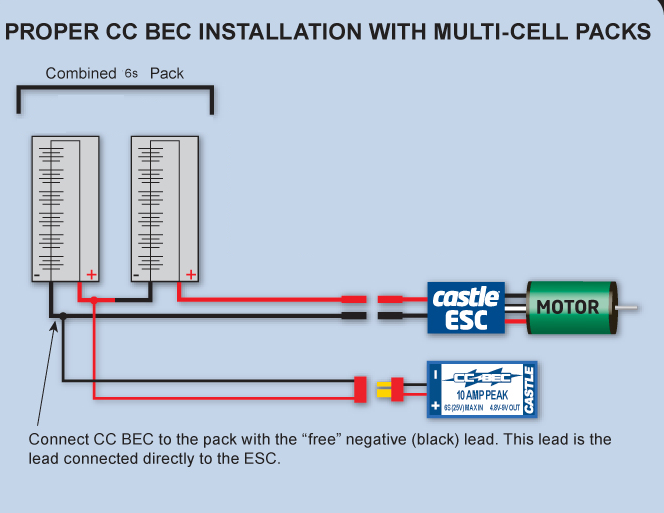 CC BEC (Battery Eliminator Circuit) is a small device that eliminates the need for a receiver battery. It draws voltage from the motor batteries and drops it to a voltage level that is suitable for your receiver and servos. This is required in applications which use high power servos, where the ESC does not have an internal BEC, or the existing BEC is inadequate. The CC BEC is designed to operate at up to 6S LiPo with a 10A* peak servo load. Generally used for cars utilizing high powered digital servos. It is also useful in smaller airplanes using 4 standard non-digital servos or 6 micro servos. Perfect for 450 size or smaller helis. If you need more amperage or voltage capability, our CC BEC Pro is the way to go! 1. Ratings are determined with a 5mph airflow at 25° C (77° F). 2. Adjustable Output Voltage may be set with Castle Link (sold separately). 3. Weight with full length wires, power wires may be shortened to save weight depending on application. Product Use Statements: Read all wiring diagrams, and usage advisories in the Resources section below before using CC BEC. Not intended for use in wet conditions, BEC is not waterproof. Use the CC BEC 2.0 Waterproof. Application Guidelines: Generally used for cars utilizing high powered digital servos. It is also useful in smaller airplanes using 4 standard non-digital servos or 6 micro servos. Perfect for 450 size or smaller helis and night flyers. Tech Notes: *Ratings are determined with a 5mph airflow on the BEC.